One of the most celebrated festivals of Maharashtra, MAKAR SANKRANTI is a festival of the harvest and of great zeal and enthusiasm. It is celebrated as Sankrat in Rajasthan, Uttarayan in Gujarat, Magh Bihu in Assam, Pongal in South Indian states like Tamil Nadu. Makar Sankranti is seen as the beginning of an auspicious phase of transition. It also marks the end of an inauspicious phase which begins around mid-December called Mal Maas or Karmas. Mal Maas is considered as an impure month and therefore an inauspicious one to do anything new and significant. The auspicious day of Makar Sankranti marks the beginning of a good and new leaving behind the bad and old. Why Makar Sankranti Always Celebrated On 14th January. Uttarayan or Makar Sankranti marks the day when the sun begins its northward journey and enters the sign of Makar (the Capricorn) from the Tropic of Cancer. It is like the movement of the sun from southern to northern hemisphere. This day falls on the 14th of January every year and celebrated until 15th of January. This is the day winter officially ends and spring begins, a transition symbolic of discarding the previous season’s bad and the beginning of a fresh new season. The Makar Sankranti festival is significant as this is the time when harvesting is complete and there are big celebrations. This is the day we acknowledge all those who assisted in making the harvest. Makar Sankranti is a festival which is dedicated to Sun deity (Surya). To Hindus, Sun stands for unity, equality, spiritual light and true selflessness. People take bath in holy rivers like Ganga, Yamuna, Godavari, etc. It is believed that taking a holy bath during this period helps in the absolution of past sins. Uttarayan or Sankrat and Kite flying go hand in hand. People of all age indulge in this event of kite flying. Many parts of India go vibrant with the Kite Festival which is glorified with colours of joy, colours of life. The Kite Festival signify ‘Cultural Strength’. In the Month of January, the serene blue sky fills with colourful kites of various shapes and sizes. Makar Sankranti is celebrated majorly all over Gujarat but the Ahmedabad, Surat Baroda is celebrating at a high pitch. Surat is known for the strong string which is made by applying glass powder on the row thread to provide it a cutting edge. It is cautioned to handle with care. But nowadays people are avoiding as many pigeons and birds get killed because of this glass strings. I have in fact seen many bikers falling to this thread and they met with an accident while driving. So I would ask everyone to be very careful when you are flying kites. But what I like about this festival is when we end up with light kandil or lamp candles to end up the celebration of this festival. The whole sky turns like stars flying in the dark night in the form of those light candles. The festival is celebrated all over with the excitement high. You smell sweet aromas of the special preparations of the mouth-watering food of the festival. Sweets and Ladoos are made out of (Til) sesame seeds. It is believed that sesame seeds have the ability to absorb and emit high amounts of Sattva (goodness or purity) frequencies. The sesame seeds are considered to awaken spiritual emotions in us and therefore the sweets are firstly kept in front of the deity. There are some health benefits of the sweets like Til ladoos and Til chikkis. These include prevention and control of diabetes; reduction in risks of cancer; improving and support of bone health; helps boost metabolic function. However, excessive consumption may cause irritation in the stomach and sometimes may lead to throat infection or a cough. Til Ladoos are made using sesame seeds (til) and jaggery (gud). People consume the chikkis and laddos with a saying “eat these sesame seeds and jaggery and speak sweet words”. In Marathi, we put it as “Til gud gya aani goad goad bola”. You can find Til dishes across the whole of India and is served with coconut and jaggery in South India. Scientifically til or sesame seed is good for memory and creates heat in your body during winters. Similarly, we eat black Chana too during winters. Chiwda curd (dahi chooda ) is a specialty of the East Indian traditions. It is a simple mix of flattened rice (chura or chiwra) and curd (dahi). Instead of sugar, people opt for jaggery to sweeten the dish and add an authentic flavor. The North Indian households are filled with the presence of aromatic khichdi and roasted papad. Halwa and Kheer (many varieties of kheer) dominate the kitchens of Punjab, Haryana, and the likes and adds to the sweetness of this occasion. Puran Poli is a dish originated in Maharashtra and is enjoyed by many people because of its flavour and texture. It is a classic flatbread stuffed with finely chopped jaggery mixed with til (sesame) and roasted gram flour. It is usually served with oodles of melted ghee poured over it and relished with an innate sense of satisfaction. Gujarati’s celebrate the festival with undhiyu and jalebis along with other delicacies like Til ki chikki, Khichdo and, goondar paak . 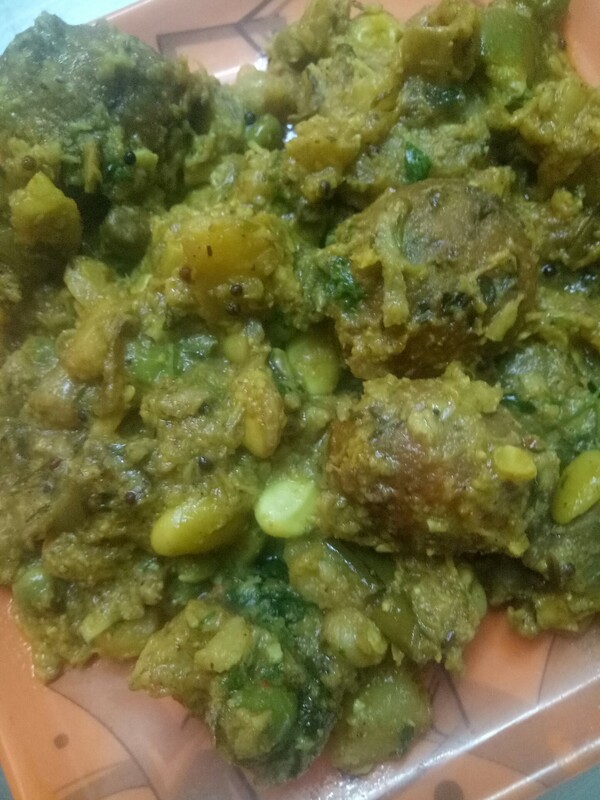 Undhiyu, being my personal favourite, I have come up with a recipe for the delicacy. Winter evenings always call for something warm, spicy and tasty. One such recipe is that of Undhiyu. All the ingredients that are included in the preparation of this delicious platter keep up the heat in our body and help us remain warm against the chilly cold weather. The Undhiyu recipe uses vegetables and spices that provide a lot of heat in our body. Undhiyu is basically eaten as a snack on the day of the Uttarayan. Let me take you to the real making of my favorite Gujarati Undhiyu, as by now you must have brought together all the ingredients on your kitchen table. You must first deep fry the vegetables such as raw banana, small potato, sweet potato, yam and suran and keep them aside. Now, to attain the green color in Undhiyu, you make the green chutney, the ingredients of which I mentioned in the basic green mixture section above. The green lehsun shall give a lovely taste. For a Jain, you might just add lots and lots of coriander. Adding some cashews and til shall make the mixture coarse. It’s time that you now prepare the Methi pakodas, for they shall be added later too. Mix all the components as mentioned above and add some water. You need to make round balls of this mixture and fry them. Without any delay, pour 4tbsp oil into the cooker and heat. You are going to deep fry some components such as tur, matar, paavta, green chana, vaal papdi . Cook it well but see to it they do not become squishy or spongy. You must have the crunch of the beans. While the ingredients in the cooker get crispy enough, let us add spices to the leftover mixture of coconut, coriander and sesame seeds. You also need to add salt as to your taste. Squeeze a minimal amount of lemon and a tablespoon or two of sugar for our taste buds. you also add vaal papdi to this mixture. Now as you see the ingredients in the cooker are cooked well, you can add the coconut coriander mixture we just made. It is time for us to bring in the greenish tinge, so now we add the green chutney we made initially. Since too much oily food is not healthy, we put less amount of oil. Now we put in the deep fried vegetables – sweet potatoes, small potatoes, raw bananas ,yam. Next, we put in the Mehti pakodas . I suggest you do not mix it with a pan. Cover it with the cooker lid and take a whistle. Open the lid , the aroma in the air and the mouth-watering look of our Undhiyu shall tell that it is perfectly ready to rest your tempting taste buds.Put the steaming hot Gujarati Undhiyu on a plate and serve with hot puri, parantha or chapati. – You can add deep fried brinjal to your recipe. – You can add an extra tadka if you like your Undhiyo a bit more oily. – See to it you maintain the crunchiness of the vegetables when fry or deep fry them. – Do not overcook the vegetables. Awesome recipes for makar sakranti. I usually just make Til Ladoos for our family, shall try something new as well this time. Til ladoos are the main attraction of makar sankrati in our family. Thanks for this detailed post on the festival. There were some unknown facts about the festival that I am glad to know now. Wow the food recipe sounds so delicious ? I love festive food a lot. Thanks for sharing this amazing recipe. Happy Makarsankranti in advance. My mom makes Til ladoo every makar sankranti. Will share this recipes to my mom 🙂 Thanks for this post. Loved how detailed and informative ur post is, and thanks for sharing it way in advance. It is always great and delightful to know about our culture. Sankrants are never complete without the typical delicacies, and gujju undhiyu is just too yum, thanks for sharing this recipe! It is really a detailed post on Makar Sankranti celebration. I too love the festivities around this festival. What an awesome recipe. This Gujarati Undhiyu recipe looks delicious and interesting to try. I am looking forward to trying this one. Thank you so much for sharing the details behind such a vibrant festival. Love the recipe of undhiyo… I always loved that taste. Would try it soon. Thanks for explaining in details about the festival,culture,food specially unidyu receipe my favourite will definitely try it out. Even we do celebrate the festival wid kite flying n a pooja. Wherein a bahu gives baayna to her mil. Wow recipe to try the festive season.